Elizabeth's winner is: Patricia Altner! Congrats, Patricia! Send me your contact info and I'll pass it along to Elizabeth. Thanks so much to everyone who participated. What happens when a newly turned vampire bites a werewolf and vice versa? We will find out in my new novel, To Hunt a Wolf, the second book in my werewolf series. 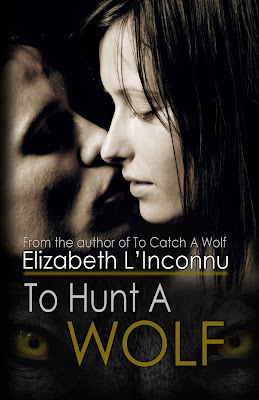 Natalie Cash knew nothing of either one until she discovered the wounded wolf she had been nursing back to health was actually a werewolf, trapped in his wolf form until he had convinced her to have the silver bullet removed from his rump. Freed at last, Adrian Gentry rediscovers his human side and falls in love with Natalie. When his angry master tracks him down at Natalie’s, the vampire bites her and turns her, knowing the werewolf in Adrian will hate the vampire in her. Distraught by this knowledge, Natalie knows she must do something drastic to keep the love of her werewolf, and knows they must both escape the vampire’s lair. Problem is that Adrian is now stuck -- courtesy of another silver bullet -- in his werewolf form, half man, half beast. Now a vampire who still has to master her own new powers, Natalie tries to find a way to help her wounded lover. Trading bites and DNA gives them both aspects of the other’s powers. Armed with the werewolf’s DNA, Natalie finds after her escape that she can walk in the daylight still with nothing more debilitating than a headache. Armed with Adrian’s DNA and his scent, she is able to track down Adrian’s family and enlists their help to rescue him and his sisters. To what extent will they both be changed however? And how will the changes in them affect their future offspring? These questions fascinate me and I hope to explore some of the answers in the third book, To Save a Wolf, which I am now starting to work on. To Save a Wolf will be the story of finding Deborah, the one werewolf sibling who is still a captive of the vampire Cedric. Her siblings, Adam, Adrian and Delilah will be looking for her. In this book I hope to explore some of the changes that affect Adrian and Natalie from being twice bitten. and To Save a Wolf will hopefully be an October, 2009 release. Leave a comment here for Elizabeth to be entered into her giveaway for a copy of one of her books. The winner will be chosen and posted here on Tuesday evening, so stop back by to see if you've won. Ok, that's definitely an intriguing premise! Hey Ms. Lynda... as always, thank you for bringing a new author to light!! Hope all is well on your end! Oh, those do sound very interesting. I love to find new authors and am looking forward to reading these. What a unique twist to the werewolf theme! Sounds like an author that could set the paranormal genre on its ear! Count me in on the giveaway. I'm always looking for new authors and series in this genre, it's my favorite! The series sounds good! What an intriguing vampire/werewolf tale. Please add my name to the drawing. Ooo thank you all for the warm welcome and I'm glad you all like the premise. Wonderful concept. I love both vampire and werewolf stories!!! And a story line romance that's pairing two species together that really are supposed to hate each other!!! It's going to be a great read. WOW! Definitely interesting new book! I am so intriged about your books. Please count me in. More books to add to my tbr list! I'm hooked. Big thanks to Lynda for letting me blog. And congratulations to Patricia on the win. Thank you all for participating. Your kind comments and interest mean a lot. She discovered the wounded wolf she is too kind that she treated it!! .Great looking urban art. I am so glad to get a peek at it!